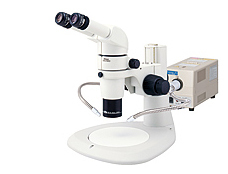 Lenses with a variety of magnifications and working distances are available. Nikon's Ergo objectives allow eye level to be continuously raised or lowered without changing magnifications or working distance. 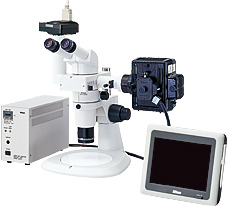 These products can be used with the SMZ1000 and SMZ800. Eye level can be raised or lowered continuously. With its inclination set at 20°, this binocular eyepiece tube allows observation in a natural viewing posture with a straight back. This reduces fatigue during long hours of operation, as strain on the neck, shoulders, and back is reduced. 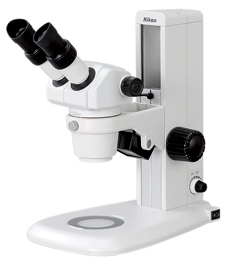 The low-eye-level binocular eyepiece tube with inclination of 20° enables comfortable observation even when using a diascopic stand or when an intermediate tube is inserted. 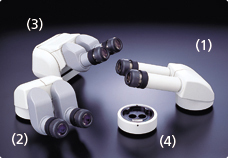 The tilting eyepiece tube allows continuous adjustment of the eyepiece inclination from 0° to 30° to suit the user's body or the intermediate equipment being used. 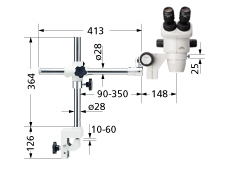 The eye level can also be adjusted up or down a maximum of 157mm by tilting and rotating the eyepiece so that anyone can use the microscope with a comfortable posture. 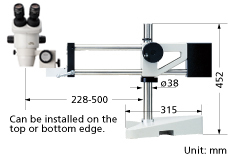 The eye-level riser allows the user to easily raise eye level in units of 25mm. The P-ICI2 uses a 12V-100W fiber-optical light source to obtain bright illumination over the entire surface being observed. The thickness of the 1/4-lambda plate for the supplied coaxial has been reduced to minimize the influence of spherical aberrations in high-NA objectives. 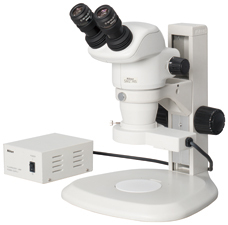 The zoom magnifications that can be used vary with each objective. Please inquire for details. It supplies conical-shaped light through an optical fiber from above the sample to it center, minimizing unwanted shadows. 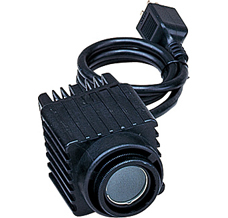 This illuminator projects light beams onto the desired position via two optical-fiber arms. The direction and angle of the illumination can be changed with simple adjustments of these flexible arms. The light source is a 6V-20W halogen lamp. This illuminator has a flexible arm that can be freely bent, allowing it to be mounted externally for use in epi-fluorescence illumination. It can also be mounted on the C-DS diascopic stand. This arm allows the C-DSLS lamp house or G-LS Epi-Fl Attachment to be mounted to a stand. A ring-shaped fluorescent tube provides uniform illumination over the entire visual field without shadows. This illuminator lights up immediately after switching ON. 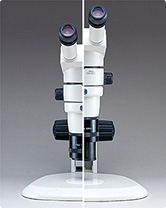 Both episcopic and diascopic observations are possible with this thin, lightweight stand. The space-saving built-in illuminator can be switched and adjusted with ease. 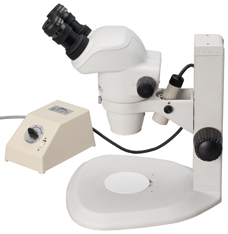 The polarizer is set on the stage while the analyzer is fitted on the objective lens cover, through which diascopic illumination light passes, making it possible to observe flakes of rock or mined ore, or double refraction images of samples. 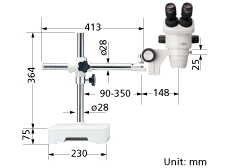 These stands are handy in microscopy with large samples not loaded onto the standard stand. 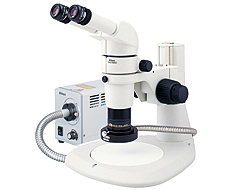 The microscope unit is mounted to the stand arm via a focusing mount. The G-US1 is a table clamp type (table top thickness: 10 ~ 60mm). combination with the SMZ 745. 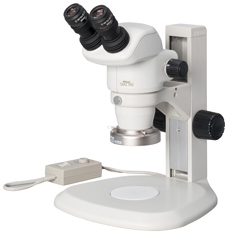 Not only can it be used for a large sample, but this extremely stable stand also easily accommodates photographic equipment. 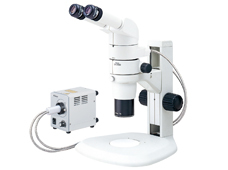 Nikon developed the P-FLA2 Epi-fluorescence Attachment for stereoscopic microscopes to allow easy observation of living cells under fluorescence methods such as GFP. Switching between the fluorescence method and brightfield method is quick and easy. If you add an optional photo port to this attachment, you can mount a DS series digital camera or a CCTV camera without using a beam splitter. Because 100% of the light is delivered to the photo port, bright images are ensured.